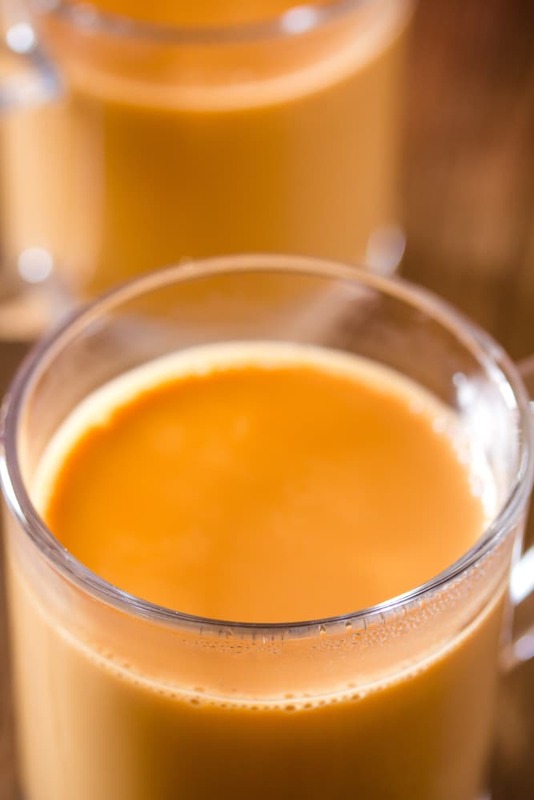 Karak Chai is Qatar’s famous tea that is made with black tea, cardamom and evaporated milk. Learn how to make this delicious strong Middle Eastern tea at home and you’ll start looking forward to early mornings for this tea! In the mood for more Middle Eastern recipes? Check out my recipes for Shish Tawook and Lebanese Rice Pilaf. 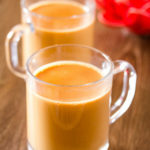 Also don’t forget to check out this milky tea if that’s your preference: Homemade Chai Recipe. Feeling sleepy? Worry not, this strong Karak Chai is going to wake you up in an instant. So here’s a little bit of truth. Most people who know me, know that I do not drink tea (until recently). I’ve been a major coffee lover for the past few years, but recently I got hooked onto homemade karak chai aka Indian Strong Tea. And I think there’s no looking back, because it’s the best kind of tea I’ve ever had in my life. I’m looking at you, weak tasteless tea bag chai. Karak Tea is the un-official national drink of Qatar, and everybody loves this strong sweet tea. It’s made with evaporated milk and spices such as cardamom and saffron. For this recipe I only use cardamom and saffron, but I know that there are many other recipes for Karak Chai that call for more whole spices. However, I feel that just using cardamom and saffron bring the true flavor of Karak Chai, as it’s not supposed to be made from tons of spices like Masala Chai. Karak Chai is popular all over the Middle East, but it originates from Qatar. EVERYBODY in Qatar has karak chai every morning. Okay, maybe I’m exaggerating a bit. But it’s like really popular in Qatar (and also the rest of the Middle East). 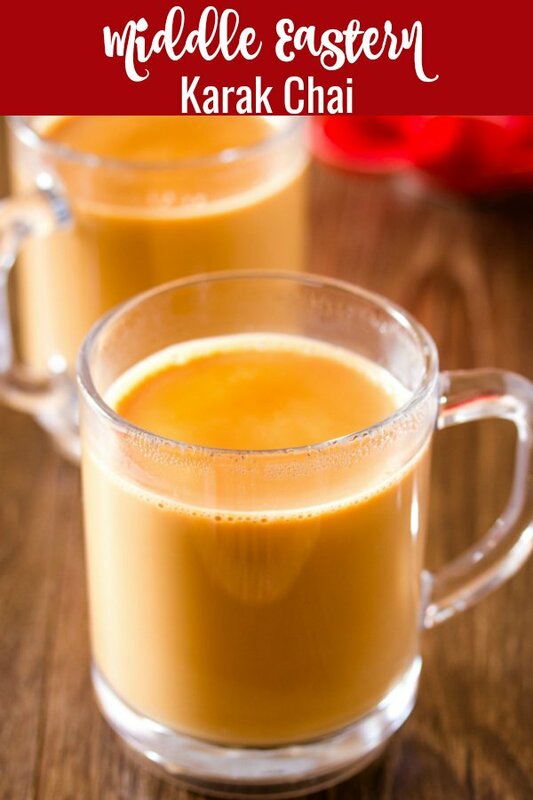 My husband is a big fan of karak chai (we discovered it in Qatar), and that’s why I decided to learn to make it at home. And guess what? It’s super easy to make. You just need to make sure you have the ratios right and also cooking on low heat for a while to bring out the flavours of chai. So What is in Karak Chai? 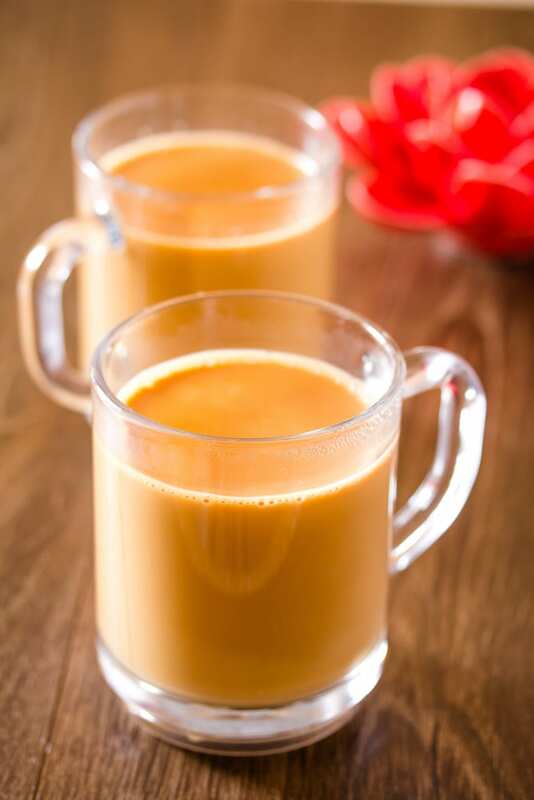 Karak Chai is similar to Indian Masala tea, except there are a few differences too. The biggest difference is in the number of spices used in each tea, and also the type of milk that’s used. 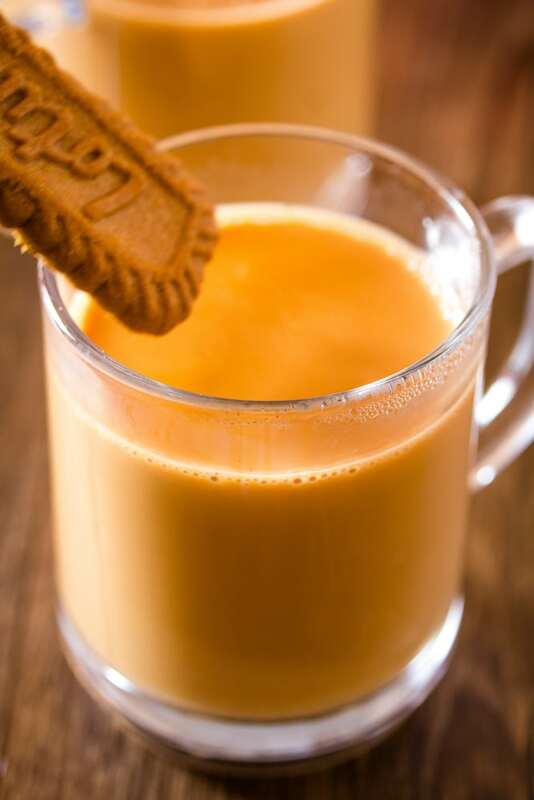 Karak Chai is made with black loose tea leaves, crushed cardamom (sometimes I use cardamom flavoured evaporated milk instead), saffron and sugar. The key ingredient for the colour and taste of Karak Tea is actually made with evaporated milk. Karak (sometimes spelled as kadak) Chai is also cooked on low heat for 5 minutes or so. The trick to great karak chai lies in the evaporated milk and also letting it come to boil a few times. So what I do is, that I bring the tea to a boil and then remove it from the heat for a few seconds, and then I bring it back to a boil and so on. I do this for about 5 minutes and oh man what a lovely tea it turns out to be. How Do You Make Karak Chai? Start by measuring 2 cups of water and bring it to a boil in a saucepan. Now the most important part the ratio of tea to water. This is a strong tea, so I use black tea leaves. For each cup of water I add 1.5 heaping teaspoons of tea. If you’re using tea bags (I don’t recommend it for this tea) I would use 1 1/2 teabag for each cup so that would be 3 teabags. After adding the tea, add the sugar, crushed cardamom pods (if using cardamom flavored evaporated milk then no need to use cardamom pods) and saffron, and bring to a boil again. P.S. In dire times, I’ve also resorted to adding cardamom powder (ONLY if I don’t have cardamom pods OR cardamom flavored evaporated milk, and it works fine too). Add evaporated milk (you can increase or decrease the amount depending on how strong you like your tea) and bring the tea to a roaring boil. Immediately remove from heat, and let the tea calm down a bit, then put it back on heat and bring it to a roaring boil again. Repeat this pattern for about 5 minutes until you can see that beautiful caramel color. Using a tea strainer, pour the tea into mugs and enjoy! 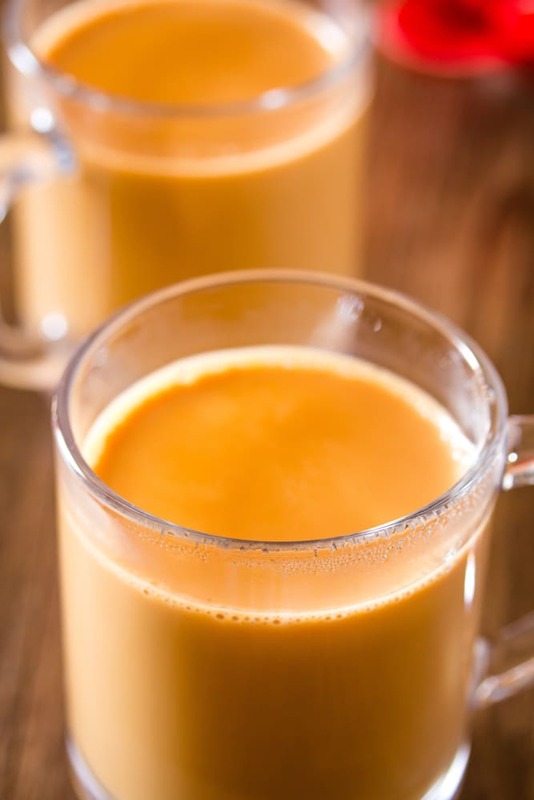 Karak Chai is Qatar’s famous tea that is made with black tea, cardamom and evaporated milk. Learn how to make this delicious strong Middle Eastern tea at home! 1/3 cup evaporated milk if using cardamom flavoured evaporated milk, then there’s no need to use cardamom pods. Add the black tea to the boiling water and let it steep for a minute or so. Add the crushed cardamom and saffron and let the tea boil for 30 seconds or so. Now add the sugar and evaporated milk and bring it to boil. Remove from heat, and then put back on heat and bring to a boil again. Continue this for 5 minutes until the karak tea is a rich caramel color. Using a tea strainer, serve the tea in mugs immediately. That was a fun read, I’ve never tried a sweet tea like this before but have all the ingredients at home and must have a go. 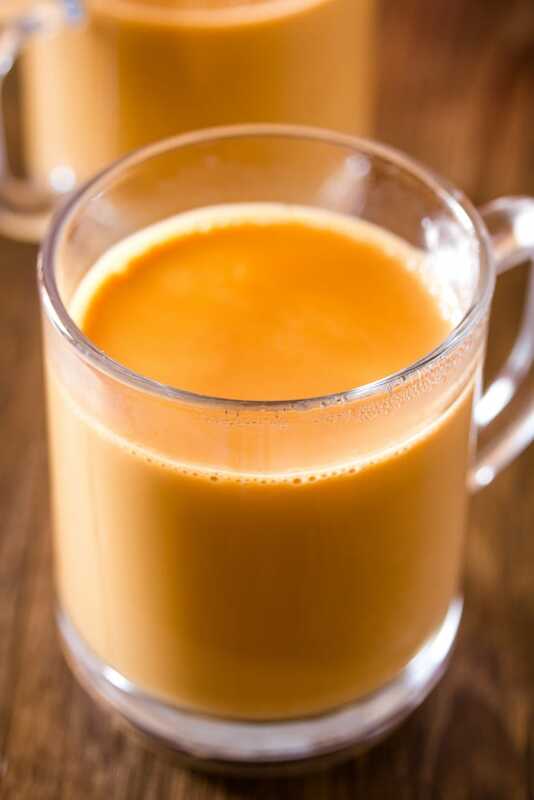 Thanks for sharing this recipe – I’m always looking to try different variations of karak tea. I love making this at home but it’s so easily accessible here in Dubai that I often get lazy about homemade. You had me with cardamom and evaporated milk ! I can’t wait to try your Karak Chai and then I will know what to order when we have a (long!) layover in Qatar next year ! Ive been looking for this recipe for years. I grew up in Qatar and used to go to the corniche and get this from the pier. Blast from the past. thank ypu for the recipe! This is the comment I was looking for – I have found countless recipes for Karak tea. I’ve been in Qatar 5 days, and since the day it was introduced to me, I immediately became addicted to this chai tea!!! Already bought cardamom seeds to take home with me. It’s AMAZING. Definitely going to try this recipe as soon as I get home!